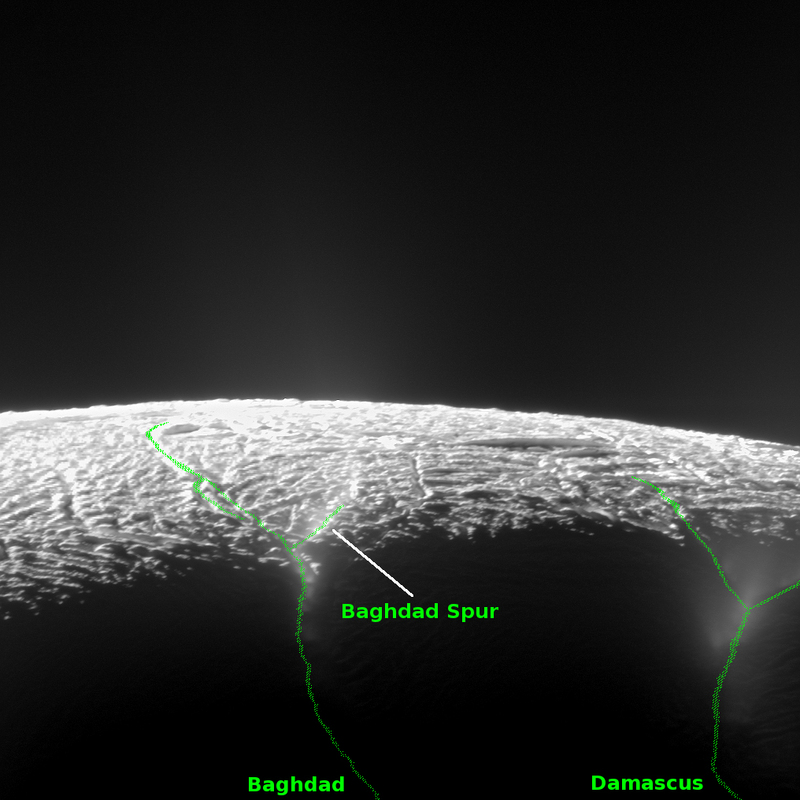 This dramatic view looks across the region of Enceladus' geyser basin and down on the ends of the Baghdad and Damascus fractures that face Saturn. The image, which looks approximately in the direction of Saturn, was taken from a more elevated viewpoint than other Cassini survey images of this area of the moon's south pole. The geysering segments of the fractures seen here are among the most active and warmest in the whole region. As seen from the spacecraft from an elevation angle of 25 degrees south, the jets are projected against the bright surface as opposed to black sky. Consequently, despite the pronounced activity, the jets appear fuzzy, or indistinct, in this image and their tilts are consequently not measurable. Though their source locations are clearly seen, this image was not used in the process of triangulation, but instead it was used to confirm source locations determined from triangulation using other images. The image was taken with Cassini's narrow-angle camera through the clear filter on Aug. 13, 2010, with an image scale about 230 feet (70 meters) per pixel and a sun-Enceladus-spacecraft, or phase, angle of about 151 degrees. This image was one of those used to confirm the sources of Enceladus' geysers as described in a paper by Porco, DiNino, and Nimmo, and published in the online version of the Astronomical Journal in July 2014: http://dx.doi.org/10.1088/0004-6256/148/3/45.